Swedish rather successful band CRASHDIET formed in 2005, and soon became part of the so called new wave of sleaze. They are said to have gained their record contract by impressing the record company staff drinking outside a liquor store. Their first album “Rest in Sleaze” was augmented by a commercial on Swedish TV, but the joy came to a halt as first vocalist Dave Lepard committed suicide in early 2006, and the band declared their end. But in 2007 they re-emerged with new vocalist H. Olliver Twisted (RECKLESS LOVE). He left in 2008 and was replaced by Simon Cruz in 2009. Albeit this commotion the band has released four albums including this one. This album is a roller coaster. There is bang on sleaze like “Cocaine Cowboys” and the potential hit “Anarchy”. The sheer energy would move a freight train. Then there is the blatant eighties style as in “Sin City” and the deep lyrics of the rather moving “Damaged Kid”. But the less energetic songs like the depressive “Excited” or the odd Rock´n´Roll/AOR of e.g. “Excited” are in majority. 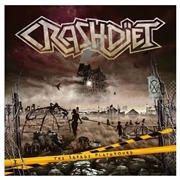 I think CRASHDIET are taking the long road instead of the heedlessness that made them famous in the first place. The know how to make punk and sleaze meet…use that!